Chief Henry Sammons succumbed to a gunshot wound sustained the previous day while attempting to make an arrest. He had been called to a local sawmill to arrest an employee who had come to work drunk. When the chief approached the employee, the man produced a handgun and shot the chief in the stomach. Despite being mortally wounded, Chief Sammons was able to return fire and killed the suspect. Chief Sammons, a WWI Army veteran, was survived by his wife and child. I was the chief of police in 2009 till 2010 . 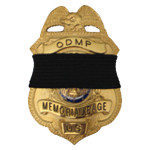 I never knew that a Chief of Police had ever been killed in Damascus GA. What a hero at rest.